The fact that the number eight is considered a lucky one in China is now widely known internationally, in part because it was mentioned so often during the coverage of the Beijing Games. This was only natural given the auspicious starting time chosen for that spectacle: 8/08/08. 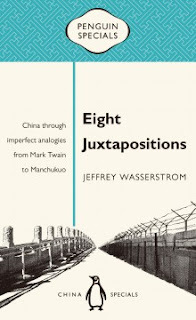 One might assume, from a quick look at my new book, that I planned it with a similar goal of emphasizing eights: the title has the word “eight” in it, it has an octet of main chapters, and the main text plus footnotes run 88 pages. Numerology was not, however, part of my planning process. And, actually, it is problematic to think of this book as the result of any sort of careful planning process. It was in many senses an accidental book, made up of things I wrote while I was supposed to be working on other things that I had no idea, while composing them, would end up being brought together. The opening few pages of the book, in which I explain what I mean by the term “imperfect analogy” and introduce the quirky comparisons to come, were the only ones written with the clear goal of being part of something longer than a commentary. The following chapters - in which I experiment with things like placing Xi Jinping beside Pope Francis, the long dead American author Mark Twain beside the still very much alive Chinese writer Yu Hua, and Beijing’s current policies toward Tibet beside Tokyo’s approach some seventy years ago to the short-lived state of Manchukuo - are all revised and updated versions of short essays that were created to stand alone, not to be part of a larger whole. I only realized after writing all of the pieces that became chapters, as well as some others that I thought at first might fit into the same book but ended up being left out, that I might have the makings for a volume. And only later still, with a lot of helpful guidance from friends, colleagues, and especially the good people at Penguin, did I realize that a useful way to organize the contents of this tiny book was by moving through an eight-year period, with one commentary per year. Before I went to college, I imagined, incorrectly, that the first things I would publish would be songs rather than essays and books. I later discovered that, as different as the genres are, some of the skills I had honed writing pop songs carried over to writing short commentaries, as in both formats, you need to keep things concise and a good hook helps. Thinking in terms of musical parallels, and dating myself a bit via the words I’m using, the big book I’m working on about China and the world in 1900 is like a still unfinished rock opera. Eight Juxtapositions, by contrast, is a collection I’m releasing on the side, made up of new versions of songs I initially released as singles, then remixed into a quirky sort of concept album. Details: Eight Juxtapositions: China Through Imperfect Analogies is published by Penguin China, as part of the Penguin Specials series. Available in paperback or as an eBook, priced in local currencies.